I am David Slomes daughter and have some knowledge both about stories relating to Irving (Issy) Slome and also other aspects of the family. The only members of the family who were in London/ Uk in the late 1940, early 1950s were Issy and David. Other Slomes in the telephone book were not related. Irving and my father travelled to the UK together from South Africa in 1931/32. My Grand mother Clara Fortas had lived in Leeds for a few years as a child when her family were on their way from Melitopol in the Ukrane to South Africa. none of whom are related. although I never heard any suggestion that she was an invalid. I do not know when Ray died. I remain in touch with most of the other cousins who are now around the world. Cecil and Robbie came over, only for short periods to study in the UK before returning to SA.. Cecil then eventually many years later moved to the USA. My father and the other brothers and sisters were all very kind, soft people who would not harm anyone. I know Ansel Slome well, since he lived and studied Law in London back in the 1960s. He is of course from another branch of the family going back to my grandfather ( Solomon)s brothers and sisters. And Alan Fortas who was a friend and body guard to Elvis Presley! Fortas was born in Memphis, Tennessee. He was the youngest of five children. His father, a native of England, was an Orthodox Jew who worked as a cabinetmaker. Abe Fortas acquired a life-long love for music from his father, who encouraged his playing the violin, and was known in Memphis as "Fiddlin' Abe Fortas". He attended public schools in Memphis, graduating from South Side High School in 1926. He then attended Southwestern at Memphis (now known as Rhodes College), graduating in 1930. For both his security needs and touring support, Presley hired people chosen from among those he could trust and depend on to manage his public appearances. This entourage included first cousins and several of Presley's friends from his boyhood in a poor Memphis housing project plus junior and senior high school friends and early employees from Memphis such as Alan Fortas, nephew of U.S. Supreme Court Justice Abe Fortas. Whilst in LA in 1966 Elvis bought a black Cadillac convertible for bodyguard Sonny West. He also bought himself a black Cadillac convertible, a black Eldorado convertible for bodyguard Red West, and a white Cadillac convertible each for friends including Alan Fortas He was a football player and also a bodyguard for Elvis from 1958 to 1969. One of Elvis closest friends and confidants. And played tambourine for Elvis from time to time. Meyer Fortes (April 25, 1906  January 27, 1983) was a South African social anthropologist, best known for his studies on kinship, family, and religious beliefs of the Tallensi and Ashanti people in Ghana. He was influential in developing comparative ethnology, particularly with regard to the religious aspects of different cultures. Through objective comparisons between his own Judaism and the religious beliefs of the African tribes he studied, Fortes found numerous similarities. As a trained psychologist and anthropologist, his work focused on the role of religious beliefs in social structures and behavior, not on doctrinal issues. In this way his work is a valuable contribution to our understanding of universal common values, supporting the development of harmonious relationships among all people. Meyer Fortes was born on April 25, 1906, in Britstown, Cape Province, in South Africa. After completing his masters degree from the University of Cape Town in 1926, and went on to study at the London School of Economics and Political Science at the University of London, where he received his Ph.D. in psychology in 1930. Fortes spent much of his career at the universities of Oxford and Cambridge. He was a reader in social anthropology at Oxford from 1946 to 1950, and then was appointed a director of the anthropology department of Cambridge University in 1950, carrying this duty until 1973. At the same time, he was a professor of social anthropology at Kings College in Cambridge. Born in Johannesburg, South Africa in September 1939, Ansel A. Slome received schooling in South Africa. He obtained his BA LLB from Pretoria University in South African and his MA LLB from Cambridge University in England. Mr. Slome has been admitted to practice law in England, South Africa and California. He worked as an attorney with Oppenheimer, Nathan & Van Dyke in London, England and was a partner with the firm Sonnenberg, Hoffman & Galombic in Cape Town, South Africa. He immigrated to the United States in 1979. He was a partner with the firm Kaplan, Livingston, Berkowitz and Selvin in Beverly Hills before becoming a founding, and then managing, partner with the firm Pollard, Bauman, Slome & McIntosh. Mr. Slome retired from legal practice in 1987. He maintains active memberships in the Law Society of London, the Law Society, Cape, and the California Bar Association. Currently, Mr. Slome is the joint managing director of Slome Capital Corp., a large, private, international investment management firm. He also acts as a director of a number of private companies. Mr. Slome is an active member of Ohr HaTorah. He was involved with the UJA (the South African equivalent of UJF) for many, many years. 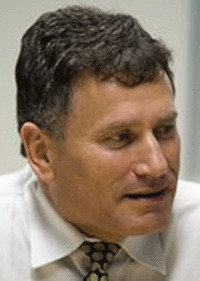 Mr. Slome was a founding member of the South African Jewish American Community of Los Angeles/Orange County, is a member of the board of The Academy for Jewish Religion, and was the founding sponsor of the Keruv Program at Valley Beth Shalom, conceived and overseen by Rabbis Schulweis and Feinstein. We (Ansel & I) are trying to find someone reliable in Lithuania to do some research for us. We know our family tree as far back as our great grandfather Zundel Slomowitz, but nothing before him. The part of Lithuania that my family came from was always Lithuania. The problem is that records for the year of my grandfather's birth were destroyed in a fire during the war, but the Lithuanians were a lot more diligent than the Russians and sometimes kept several sets of records, so we will keep trying. I know, for example, that my great grandfather was also born in Pasvalys, and although we're unsure of his birth year, we've got a reasonable idea.